Some of the various oils that are or have been available for commercial use. Some of the various oil products that are or have been available in small packaging for the home market. Use caution when using spray program that call for both oil and sulfur. Together they are phytotoxic to plants. These grapes were sprayed with oil and then a leaky nozzle hit them with a sulfur solution resulting in burnt leaves. Adapted by Jay W. Pscheidt from a similar article: Walsh, D.B., Zalom, F.G., and Grove, G.G. 2000. Petroleum spray oils - an airblast from the past, with a slick future. Good Fruit Grower. 51(8):45-48. Chemical Composition. PSOs have four basic chemical structures: paraffin, naphthene, olefin, and aromatic. Olefin and aromatic structures contain double-bonded atoms rendering them less stable and more phytotoxic. Naphthene has no double bonds, but is more easily broken and therefore more reactive (thereby potentially phytotoxic) than paraffin. Paraffin is the most desirable structure; it is the least phytotoxic and has good viscosity for application. Virtually all oils are a combination of two or more of these chemical structures—for practical use as a PSO, an oil should be at least 60% paraffin (Simanton and Trammel 1967). For summer (in-season) use, the paraffin content should be even higher. Improvements in refinement techniques have enabled production of PSOs with higher paraffin levels. Carbon Number. PSOs all have pesticidal properties but also have phytotoxicity potential. Pesticidal activity generally increases with increasing paraffin content, up to a carbon number of approximately 23. Plant phytotoxicity becomes a chronic problem when the carbon number is larger than 25 (Jacques and Kuhlmann in press). Staying within this narrow range of effectiveness, most commercially available oils have carbon numbers in the 20-to-25 range. Distillation Temperature. U.S. regulatory agencies qualify PSOs with the ASTM D 1160 vacuum-distillation method. This technique measures the temperature at which 10, 50, and 90 volume percent of the PSO distills off under a vacuum of 10 mm of Mercury. If the 50% distillation temperature is 224 ± 4.5º C (435 ± 8º F) and the difference between the 10% and 90% distillation point, called the “range,” is less than 44.4º C (80º F), then the PSO is called “435 narrow-range oil” (Chambers 1992). Oils with this property are less reactive, therefore less phytotoxic, and more appropriate for in-season use. Degree of Refinement. Degree of refinement is gauged by a spray oil’s unsulfonated residue (USR). USR is the volume of the oil that does not react with N sulfuric acid. When an oil is exposed to N sulfuric acid, the unsaturated groups or carbon double bonds in molecules react or become sulfonated. Aromatic compounds are also consumed in the sulfonation reaction. The final oil volume, expressed as a percent of the original amount of oil, is the USR. A minimum USR of 92 is recommended for protection against phytotoxicity (Simanton & Trammel 1996, Reihl 1969). It should be noted that pesticide activity does not increase above 95 USR (Chapman 1967). Viscosity. The flow characteristics of an oil and concentration of deposits on a plant during treatment is important to the safety of the plant. Lighter oils flow more freely and spread more evenly over at the plant surface, making them more appropriate for warmer temperatures and times of greater foliage, while heavier oils, which tend to bead up more on the plant, should be used primarily during dormancy. Most of today’s pest-control PSOs are highly refined. Many can be used throughout the entire season if the label instructions are followed carefully. Paraffin-based oils and refined petroleum distillates account for less than 10 percent of the ‘mineral oils’ and ‘unclassified petroleum oils’ currently used (California Department of Pesticide Regulation 1996). The ‘refined petroleum distillates’ category includes several products that are used as insecticides or fungicides. 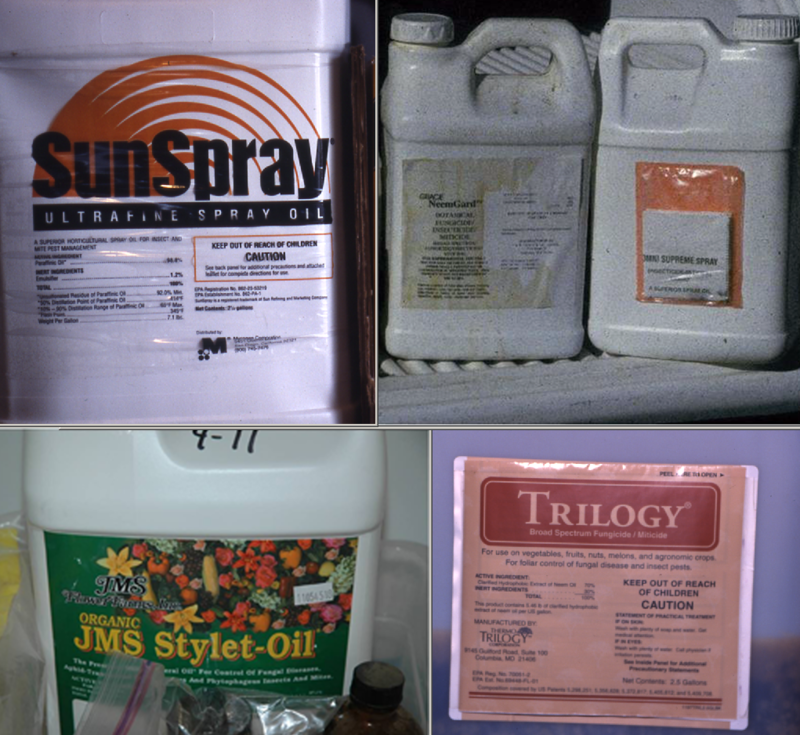 These products, are more refined and safer to use during the growing season and in warmer temperatures. In addition to horticultural mineral oils, some registered pesticidal oils are derived from oilseeds such as castor, cotton, and soybean. While such vegetable oils can be quite effective in controlling scales and other insects, they are rarely used, except by organic farmers, because of their potential to cause phytotoxicity. Primarily, these materials are used as refined spray adjuvants. 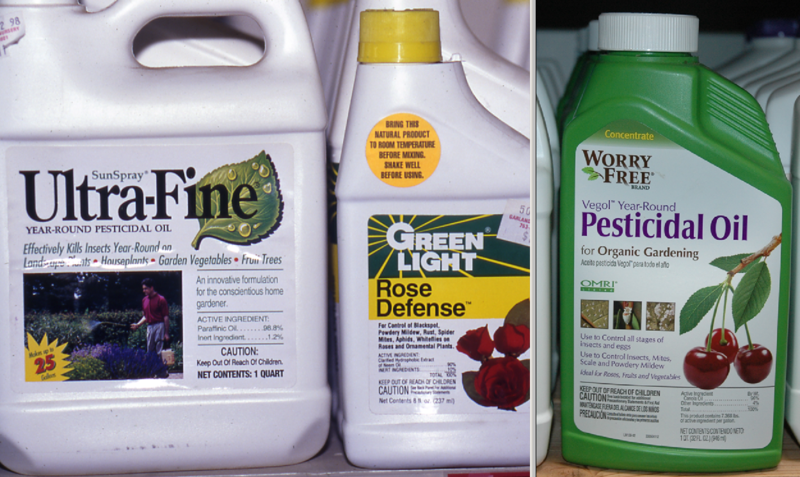 Horticultural mineral oils have long been used as adjuvants with conventional pesticides (such as insecticides and copper-based products) to improve the level of efficacy of these products. The oils aid in coverage and increase the penetration of insecticides into waxy plant surfaces. Used alone, PSOs kill insects and mites through suffocation by smothering. They are effective in all stages of insect growth, including the egg stage. Horticultural oils will work only if the insect pest is present on the plants. Prophylactic applications are of no use and are not recommended. PSOs are used for control of black sigatoka of banana, greasy spot of citrus, and have been used successfully for control of powdery mildew diseases on a variety of crops. PSOs are effective in apple, cherry, cucurbit, grape, peach, rose, and tomato powdery mildew management programs. They are excellent stand-alone fungicides and are useful as companion products in strobilurin and DMI (demethylation-inhibiting) fungicide resistance management programs. PSOs have fungicidal and fungistatic activity, and there is an increasing amount of evidence that they actually boost a plant’s resistance to infection by altering the host physiology. If used in combination with locally systemic fungicides, PSOs will facilitate foliar penetration. PSOs are useful in cherry mildew management programs if their use is restricted to no later than the pit-hardening stage, which minimizes the risk of oil damage to fruit. Oils are also extremely useful in cherry and peach nurseries where disease pressure/resistance risk is extremely high. On grape powdery mildew, oils showed moderate protection for up to 4 days, excellent pre- and post-lesion curative action, and excellent antisporulant activity (Northover and Schneider, 1996). They are effective in alternation with DMI and strobilurin fungicides. Use of oils exclusively during the growing season had some drawbacks including reduced sugar accumulation in grape and fruit and foliar damage to cherry. Oils are not quite as effective as stand-alone fungicides against apple mildew, particularly when disease pressure is high. They are an appropriate choice in resistance management programs. Regardless of crop, PSOs are usually the grower’s best choice for getting a handle on a mildew problem that appears out of control. During warm weather, plants should be irrigated prior to PSO application. Sprays should be applied when temperatures are cooler, such as early mornings or cloudy days. Allow plant tissues to dry after rain or irrigation before applying PSO, and avoid application if humidity is expected to remain over 90% for 36 hours or longer. Avoid applications during shoot elongation. Do not apply oils when temperatures are above 100º F or below 40º F.
Horticultural mineral oils present a reduced-risk approach to controlling pests in keeping with the movement toward more biologically-based systems. We know from currant usage that oils can act as direct controls for scale insects, mites, and aphids in some crops. Research is needed to improve efficacy and further reduce phytotoxicity. The present uses could be expanded to include other crops, more acreage, and other insects such as leafhoppers, mealybugs, and leafrollers. Used in combination with synthetic fungicides, PSOs may help reduce or prevent the buildup of fungi resistant to novel fungicides with specific modes of action. Horticultural mineral oils have long been used as adjuvants with conventional pesticides to improve the level of efficacy of these products. Their use in combination with reduced-risk pesticide products for insect and disease control should be more widely tested to see if these materials can be used more effectively, or at lower rates and therefore more economically. PSOs are already applied to a wide variety of crops. Specific guidelines for their use against insects, mites, and diseases have already been established on many crops, attesting to their potential and acceptance. Horticultural mineral oils are relatively inexpensive and safe to use. These products could play an important role in the establishment of future IPM systems that rely less on conventional pesticides. Chambers, G.V. 1992, Selection of horticultural mineral oils: myth and fact. Proceedings, 1992 Florida Citrus Integrated Pest Management Short Course, Nov. 17-18, 1992. Chapman, P.J. 1967. Petroleum oils for control of orchard pests. New York State Agri. Exp. Sta. Bul. No. 814. Geneva, NY. Grove, G.G., Boal, R.J., and Bennett, L.H. 2000. Managing powdery mildew of cherry in Washington orchards and nurseries with spray oils. Plant Health Progress. DOI:10.1094/PHP-2000-0628-01-RS. Jacques, D.F., and Kuhlmann, B. In Press. Exxon/Esso experience with horticultural mineral oils. Proceedings, Spray Oils 2000. Sydney, Australia. Northover, J., and Schneider, K.E. 1996. Physical modes of action of petroleum and plant oils on powdery mildew and downy mildew of grapevines. 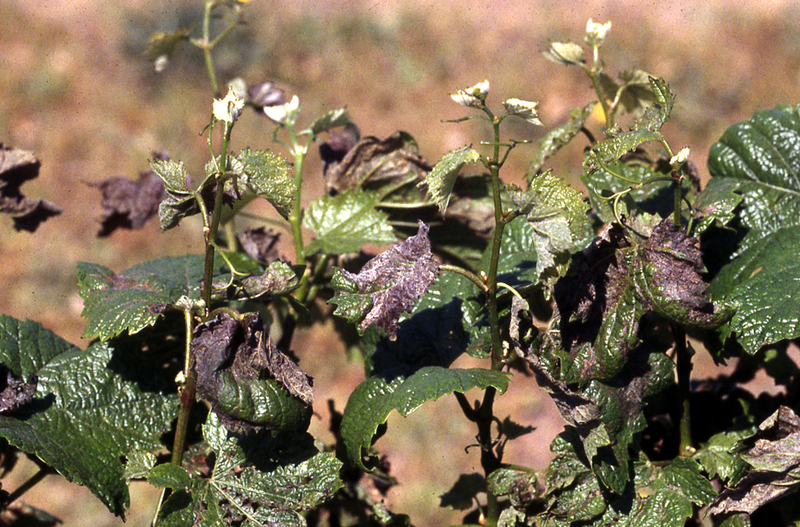 Plant Disease. 80:544-550. Pearce, G.W., Chapman, P.J., and Avena, A.W. 1942. The efficacy of dormant oils in relation to their composition. Econ Entomol. 35:211-220. Simanton, W.A., and Trammel, K. 1966. Recommended specifications for citrus spray oils in relation to effect on citrus trees in Florida. Proc. Fla. State Hort. Soc. 26-30.